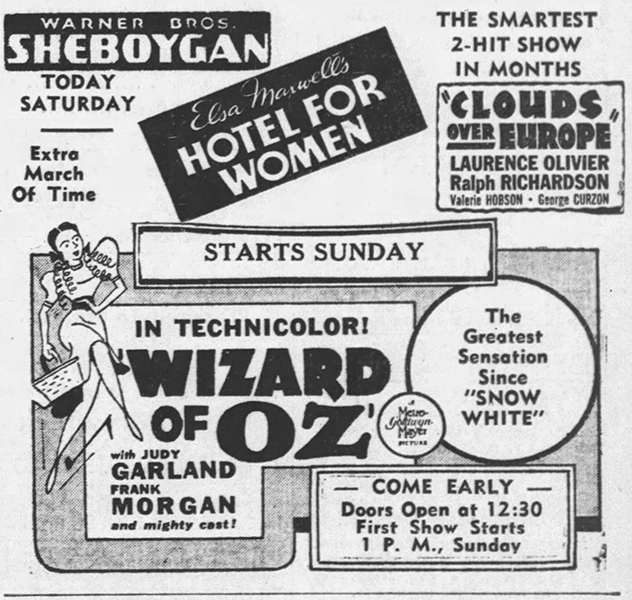 August 11, 1938: Judy’s eleventh (and final) appearance on Frank Morgan’s limited series of 15-minute shows occurred on August 9th but on this date, she’s included in listings for Morgan’s show, so it’s safe to assume that this night’s show was a re-broadcast. Little is known about these shows outside of what the newspapers tell us, which do not include the actual contents, just schedule listings. No recordings are known to survive. Judy was listed as being a part of the shows that aired on June 6th, 14th, 21st, 28th; July 5th, 12th, 19th, 26th; and August 2nd, 6th & 9th. She’s not listed in the final three episodes on August 16, 23, & 30. No recordings are known to exist of any of the shows nor is there any information as to what Judy sang. 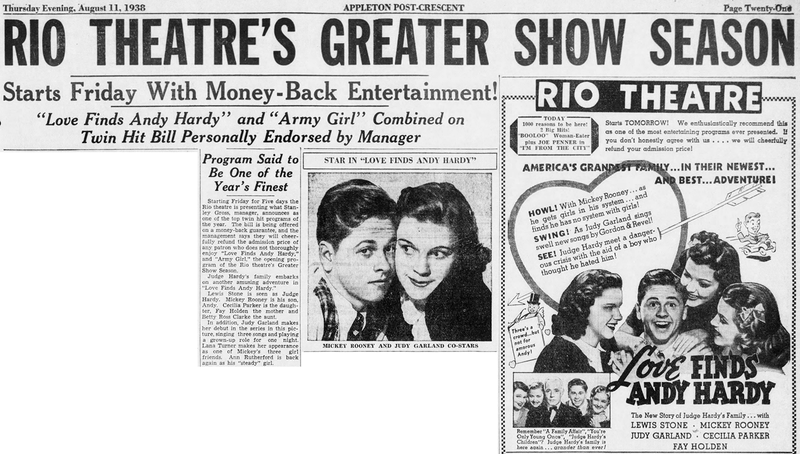 August 11, 1938: More for Love Finds Andy Hardy, this time from Appleton, Wisconsin. 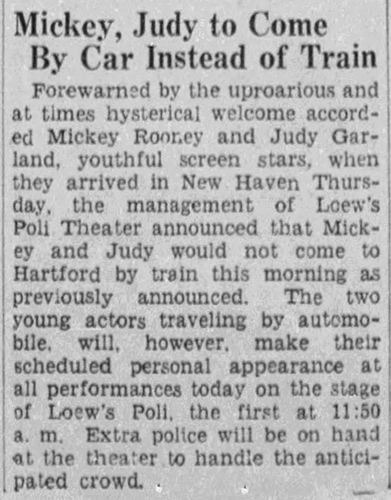 August 11, 1939: Judy and Mickey Rooney performed for one night only at the Lowe’s Poli Theater in New Haven, Connecticut. The duo arrived the day before from Bridgeport, Connecticut. 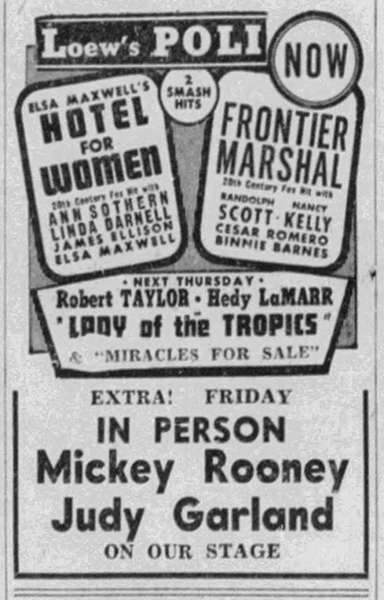 Images above: Three notices about the duo’s appearance in New Haven; the blurb about their arrival in New Haven by car; the ad for Loew’s Poli (the film being shown was not The Wizard of Oz but the Hedy Lamarr & Robert Taylor drama Lady of the Tropics. Above are two articles from the Hartford Courant. The first was published on August 10th and the second on August 11th. Note the photo in the second article. It’s Lynn Bari. 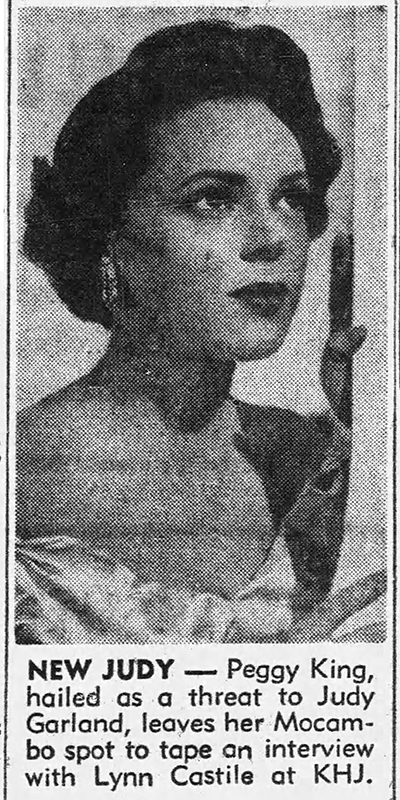 Bari played a big role in Judy’s personal life in the 1950s. She was the first wife of Judy’s third husband, Sid Luft, and sued him several times and Judy was collateral damage, more or less. Click on the images to get to the larger versions to download and read. They’re quite fun. 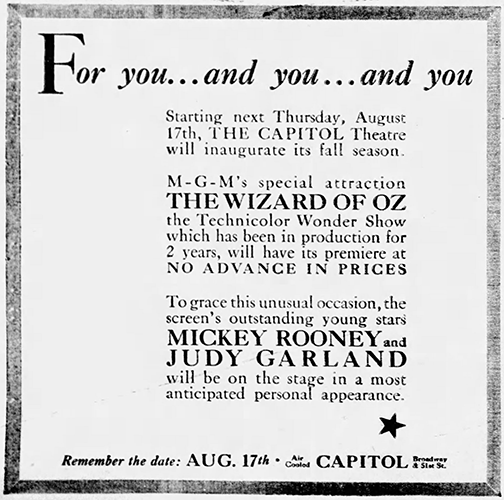 August 11, 1939: This was the night that the lucky boys and girls were picked from Loew’s theaters in the New York area to have lunch with Judy and Mickey Rooney on August 16th at the Waldorf Hotel, a day ahead of the New York premiere of The Wizard of Oz on August 17th. 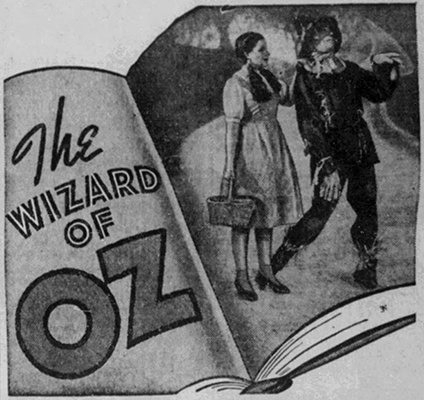 August 11, 1939: Some moreWizard of Oz ads and notices from various papers. Atlanta, Georgia, was having an Oz character dress alike contest, prizes of $20 each going to the best Dorothy, Scarecrow, and Tin Woodman; $8 to the second best of the three; $5 to the third best. 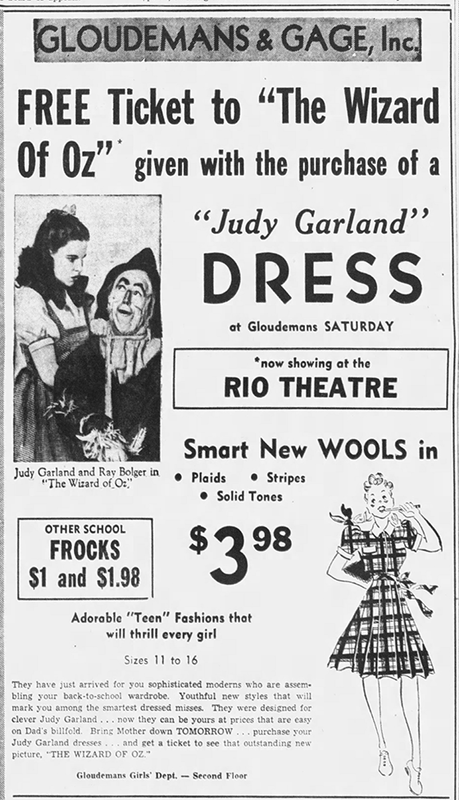 Appleton, Wisconsin, was giving away free tickets to the film with the purchase of a “Judy Garland” dress. 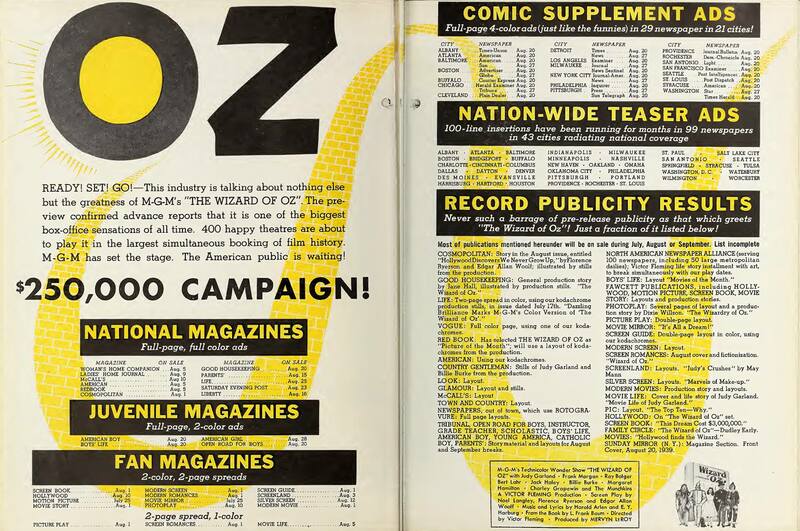 August 11, 1939: This wonderful two-page spread appeared in various trade magazines promoting the upcoming release of The Wizard of Oz. 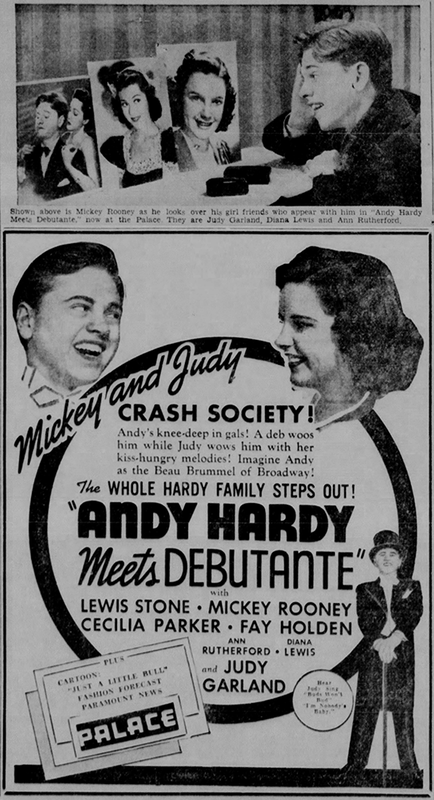 August 11, 1940: More for Andy Hardy Meets Debutante, plus another article that was allegedly written by Judy. It’s difficult to imagine that not only did she have the time to compose an article, even if it was attributed “as told to May Mann” but that she would incorrectly give her sister Suzy’s name as “Suzanna”!! The song was nominated for the Oscar for “Best Song” but lost to Irving Berlin’s “White Christmas” from Holiday Inn. Talk about tough competition! At this point, there was no limit on the number of nominees for “Best Song” and due to the fact that there were quite a few musicals being made many songs were nominated. Photos: All photos were taken on this day and August 12th. Judy is seen with Roger Edens and crew on the set; director Busby Berkeley clowns with Judy and Mickey; Frederick Burton plays Judy’s father; and co-star Virginia Weilder; other photos were taken during the filming of “How About You?” on both this date and August 12th. 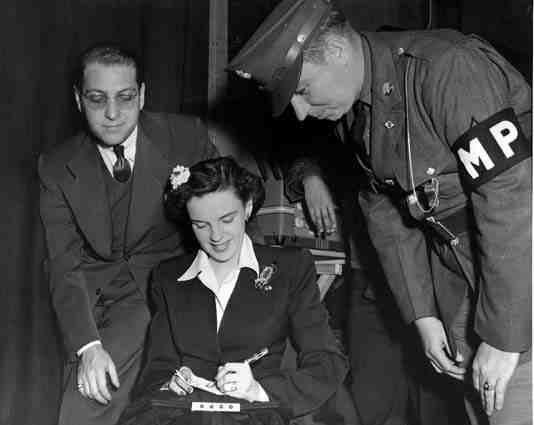 August 11, 1942: Judy was, (allegedly as it’s unclear just what Judy wrote and what was written by the studio – the latter was usually the case), the guest writer for Walter Winchell’s famous “On Broadway” column. Photo: Judy and husband David Rose at an Army camp. YOU DON’T HAVE to sing or dance to entertain the soldiers. All you have to do is talk. Just pull up a chair, sit down and be prepared to answer a lot of questions. That’s one thing I found out during my tour of the Army camps. All the fellows want to know about Hollywood and the motion picture stars and I wanted to know all about them. If the soldiers asked me questions, it didn’t compare with the quiz I put them through. All my life I’ve wanted to travel throughout the United States, staying a week or two in each town. I wanted to meet people from different parts of the country. When you live in one town, your scope is narrowed. Of course, a trip like that would be impossible for a working girl, but I didn’t have to make it. In each camp I met and talked with boys from every city and State in the Union. It was everything I expected and more than an education. I had to know about each one, where he came from and what he did. The thing that touched me most was that they were equally interested in me. If it hadn’t been for the boys at Camp Robinson, I would never have had a wedding cake. The day we played there was my wedding anniversary. My husband, David Rose, who accompanied me on the trip, and I were talking about it. The boys overheard and that night we were given a surprise party. The highlight of the evening was a huge wedding cake topped by a tiny bride and groom. A wedding cake was the one I felt cheated of when we were married. Now I had that, thanks to a bunch of swell people. The first time I sang for the soldiers I was scared to death. My knees shook and my voice trembled with a severe case of stage fright. It seems silly now, as I look back on it. Every performer dreams of stopping a show, but believe me, no show was ever stopped with the thunderous applause and appreciative response that greets an entertainer playing to a group of soldiers. In a way, touring the camps was like my old vaudeville days. Making overnight jump on milk trains and playing four-a-day instead of the usual two. It was like “old home week.” Many of the performers were people with whom my mother and father, as well as my sisters and I, had played in vaudeville. It was wonderful to see these people, headliners twenty-five years ago, return to bring the house down in Army camps all over the country. One of the troupers told me he never hoped to experience a greater moment than the day he opened at the Palace Theatre eighteen years ago. But he did when, with the same act, he received an even greater ovation at Fort Knox in Louisville, Kentucky. Willie Shore, the “Abba-Dabba Man,” who was my favorite comedian when I was a little girl, played with us at one camp. He does an act with a seltzer-water bottle and I used to sit out front with the soldiers and watch him. It never failed that when he squirted water it would land on me. This often resulted in my appearing on the stage in a slightly wet and bedraggled condition, but it was wonderful. The performers were all my old friends and it was grand to see them back in front of an audience where they belong. Camp shows have not only brought entertainment to the soldiers, they have revived vaudeville and opened a new field for young hopefuls who up to now have had no opportunity to appear before an audience. A new cradle for talent has been found. The first time they asked for the “Gable” song I was stumped. It had been a long time since I had sung it, but after ad-libbing the lyrics a few times, the original ones came back to me. The shows were all at night and my days were spent touring the camp. There wasn’t a spot I . missed seeing, from the kitchen to the rifle range. Mealtimes were fun. The only bad part was that the food was so good I gained eight pounds. We ate in the mess hall and all the boys and a steady diet of steak and potatoes, fried chicken and pie worked hardship on the brand new figure I had worked so hard to acquire. Now I understand why all the boys come home on furlough looking so strong and healthy. It’s that Army food that puts the pounds on. They howled and when I arrived home they sent me a huge chart listing all the insignias and what each stood for. Just to keep me straight, they wrote. There is one thing for which I shall be eternally grateful, they laughed with me, not at me! If this war must go on, and if it ever settles down to one major front, I have one great ambition. It is to follow in the footsteps of Elsie Janis, who did so much on the battlefields of World War I. The cheer and laughter that she brought to the front line trenches is a work that will never be forgotten. When I inquired about the possibilities of doing this, they told me our fighting forces are too scattered now, but soon show people would be sent to a different section of the conflict for just the purpose. A truck to cart me around and a piano for accompaniment would be all I’d need. Until such a time as I am able to go to the front – or a front – I will continue to do all I can for the boys at home. The camp tour convinced me that we can never do enough for the soldiers who have left their homes and families to fight our war. 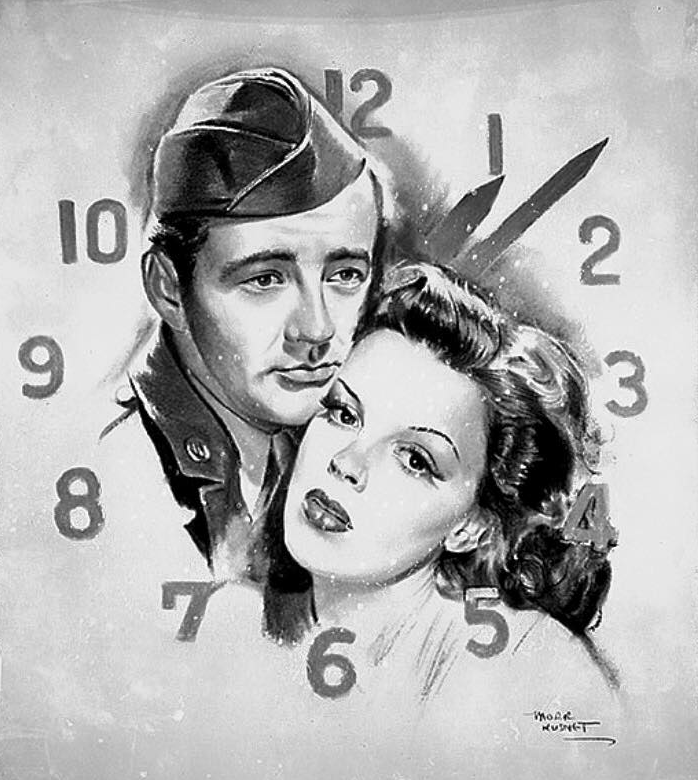 August 11, 1944: The Clock filming continued with scenes on the “Interior Living Room – Alice’s Apartment.” Time called, 10 a.m.; dismissed: 5:45 p.m. Fred Zinnemann was still the director of the film at this point and would continue for another 13 days before being replaced by Vincente Minnelli. 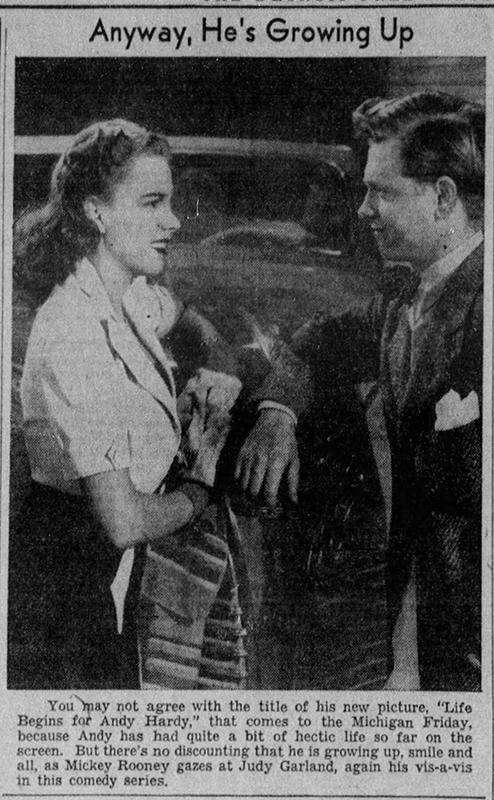 August 11, 1952: Is Peggy King a threat to Judy Garland? Peggy who? 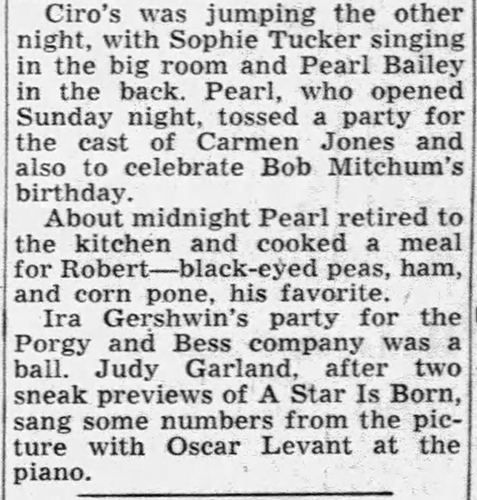 August 11, 1954: Hedda Hopper reported on Judy’s attendance at Ira Gershwin’s party for the “Porgy and Bess” company. The event must have happened a week or two before this publication as by this point Judy was already on her vacation in Europe. 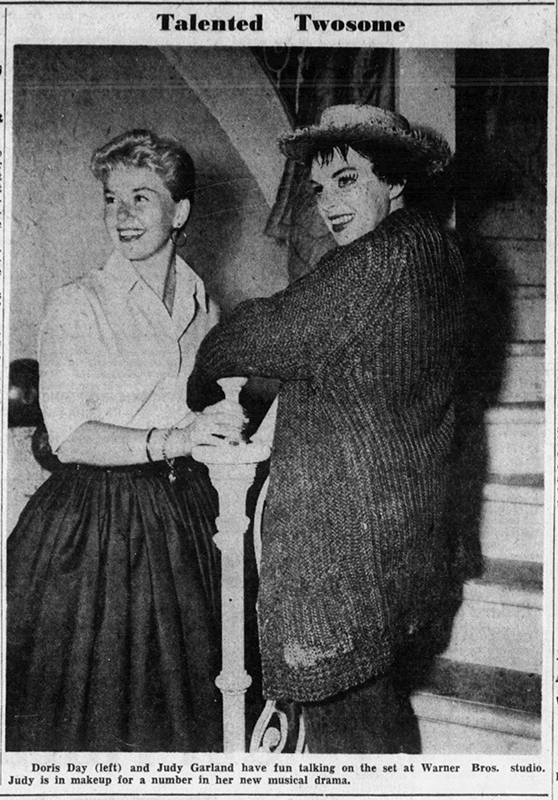 Also included here is a publication of the popular photo of Judy with Doris Day on the set of A Star Is Born, as well as the first in a series of three articles about Judy simply titled “The Judy Garland Story.” The articles were allegedly told to the author, Emily Belser, in an interview. Over the next decade (plus), other articles purporting to be the story of Judy Garland were published with that same title. There are few stories in show business that pack more of a “heart wallop” than the return of a star who has been down – and almost out. And of all such stories, none beats that of Judy Garland, once so desperate she tried suicide but who now once again seems to have the world at her finger-tips. This is the first of three articles in which Judy Garland, in a rare interview, tells her story. HOLLYWOOD – Two sharp rings on the warning bell shrilled through the huge stage and a hush fell over the crowd. And from deep upstage center, cake-walking as only she can came Judy Garland the same freckle-faced, snub-nosed charmer whose name has been a byword in the entertainment world for almost two decades. 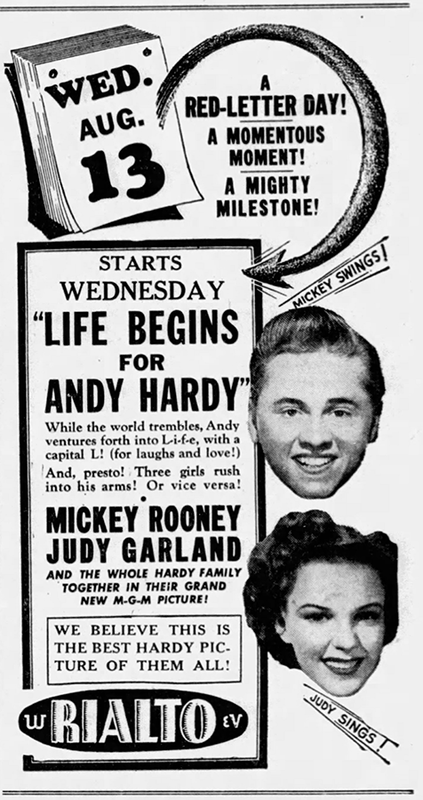 For 14 and a half minutes – the second longest single dancing sequence in film history – Judy went through the intricate steps and sang the song that made her famous. The scene is from “A Star Is Born,” a movie three years in the gelling one year in the making and more than eight months in the filming. Scattered members of cast and crew and a handful of visitors on the set drew together when the number ended and shook their heads in agreement. 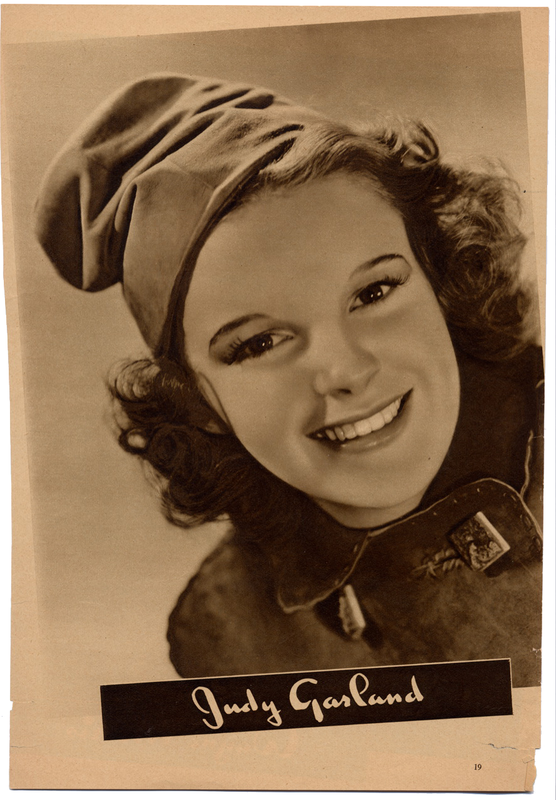 Judy Garland has surely kicked that old saw – “Champs never come back” – right ‘n the teeth. The Garland story is a study in human emotions enumerating the heartaches of a struggle back up the ladder once fate has kicked a gal downstairs. It revolves around an irrepressible youngster who parlayed a tremulous voice and personal magnetism to a niche high in the movie firmament. But it also is the story of an uncertain young girl caught in high-pressure demands of “just-one-more-movie-this-year” and the mad whirl that is Hollywood. That was the Garland of yesterday. The Garland of today is calm, grown-up, self-assured. It was in this vein that she greeted this reporter in her dressing room after finishing the sensational dance number, “born in a Trunk,” that parallels her own hectic and thrilling life as an entertainer. The former child star made her first footlight appearance by sneaking onto the stage where her parents entertained between reels. She was only three years old, but she’s been winning her own bows ever since. Judy’s Ma and Pa were Frank and Ethel Gumm who prophetically met in a motion picture theater. Frank was a vocalist who led the community “sings,” and Ethel was the piano thumper. From this stagestruck couple, Judy inherited her love of greasepaint. It was with her two sisters – Virginia and Suzanne – that she made her first full-fledged stage debut. “By that time,” Judy said, “my father owned the theatre so there really was something to the report that it was a matter of knowing the right person to get the right job. But it was the acting bug and all that goes with it that nearly proved the undoing of Judy Garland. She rose too fast, lived too fast and descended – too fast. Fame, fortune, a marriage crack-up and a broken film contract proved too much for the high strung, sensitive Judy. She tried suicide – and failed at that too. 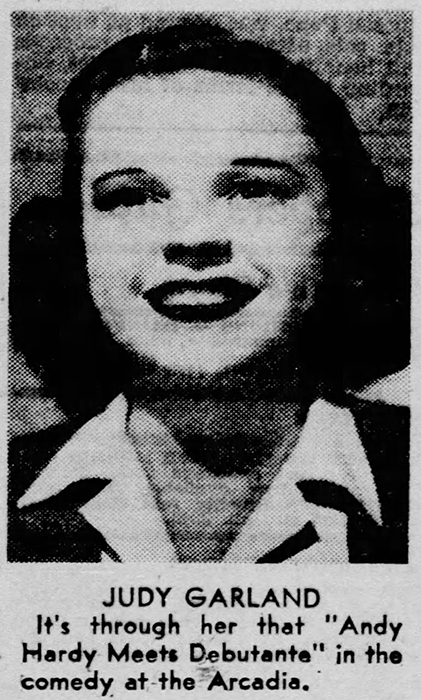 August 11, 1955: Judy, or rather husband Sid Luft, canceled her upcoming appearance in Sioux Falls, South Dakota. 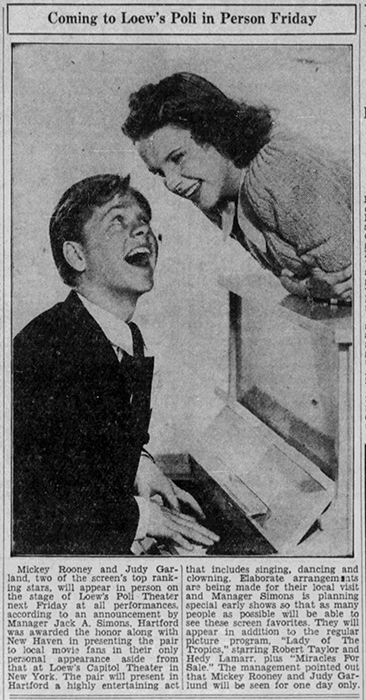 This was part of a sweeping cancellation of Judy’s touring of “The Judy Garland Show” brought about by Judy signing a contract with CBS-TV for her very first TV appearance in late September, which necessitated the cancellations so Judy could rehearse for the show (and record for Capitol Records). 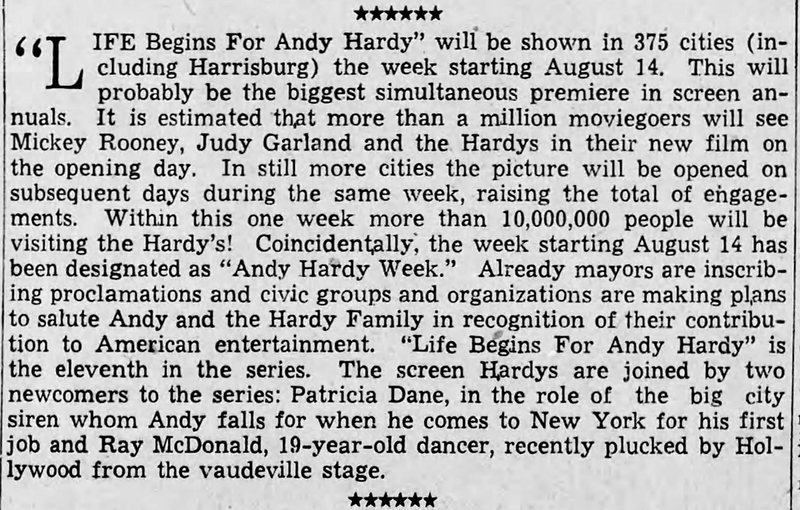 August 11, 1956: A nice blurb in Mike Connolly’s column about Judy’s upcoming return to The Palace Theater in New York. 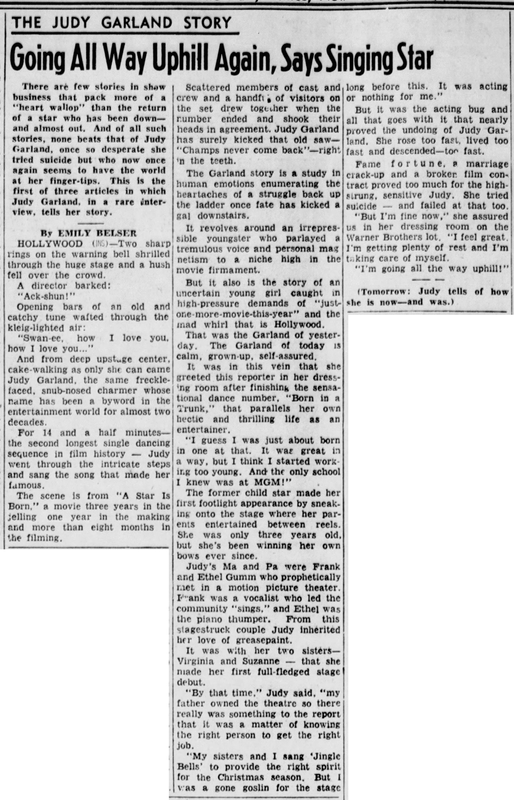 August 11, 1958: How did the manager of The Cocoanut Grove keep Judy on schedule? According to columnist Mike Connolly, he picked her up every evening and drove her to the venue and the back home when the show was over. 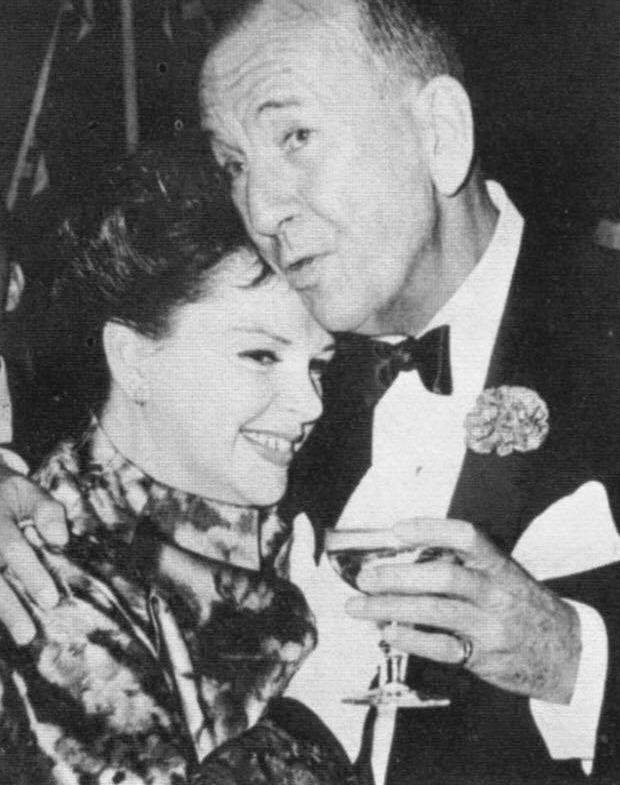 Week of August 11, 1961: Judy took some time out from her busy concert schedule and went to Boston with her publicists John Springer, and friend/mentor Kay Thompson, to attend the out-of-town opening of Noel Coward’s new musical, “Sail Away.” During this trip, “Redbook” magazine recorded a conversation backstage between Judy and Noel, from which excerpts were published. 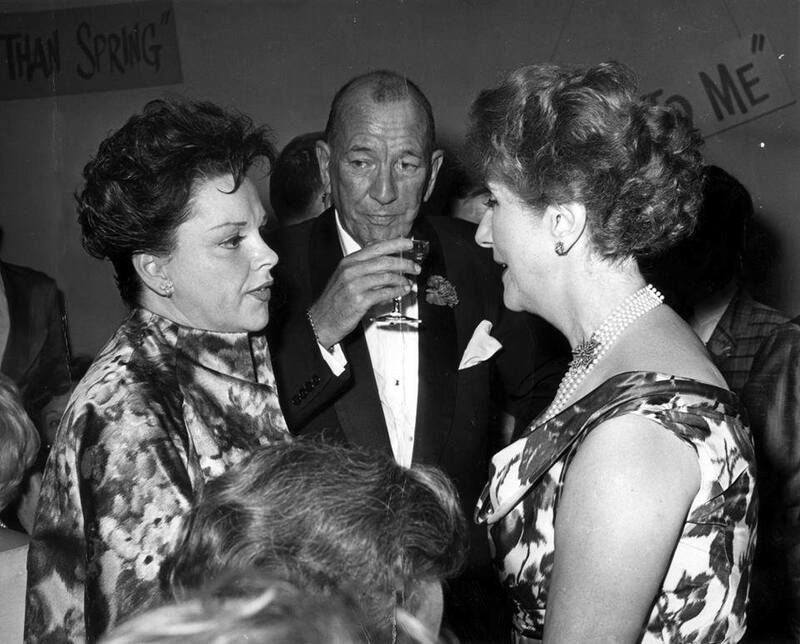 Photos: Judy with Noel Coward and Lynn Fontanne at the Broadway premiere of “Sail Away” on October 3, 1961. Note that Fontanne starred in the original Broadway version of “The Pirate” which was made into the 1948 film of the same name starring Judy and Gene Kelly. I wonder if they ever compared notes about the show/film? 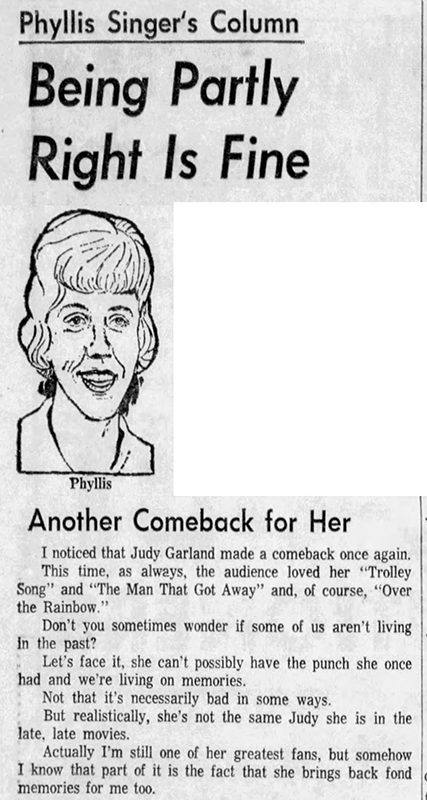 August 11, 1967: Columnist Patty Singer wrote this kind of snarky comment which was no doubt prompted by Judy’s successful comeback currently happening at The Palace Theater in New York.